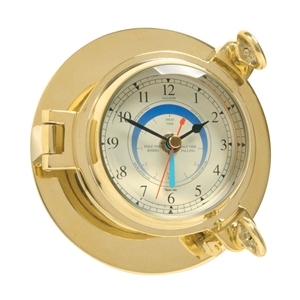 Saloon Porthole Range has hefty solid cast brass casings, scuttle clamps, bevelled glass fronts and brass hands with black subsidiary indicators on light cream faces. Operates by battery-powered quartz clock mechanism. Tide Clocks are influenced by the orbit of the moon around the Earth. To show this, the tide clock has an extra hand, which makes a complete sweep at the lunar rate of approximately 12.5 hours instead of the normal 12. (Please note: because the lunar cycle varies with the Earth's, there are times in a month when actual tides are a few minutes ahead or behind the clock). Outside diameter 9", face diameter 5.5", depth 2.25".